Floor space a problem??? Look to the top! Look to MAXITOP! Lets Face It! Plant managers have to maximize their floor space as much as possible. So when it comes to add a needed new piece of equipment, they search for the area where it will encumber the least. 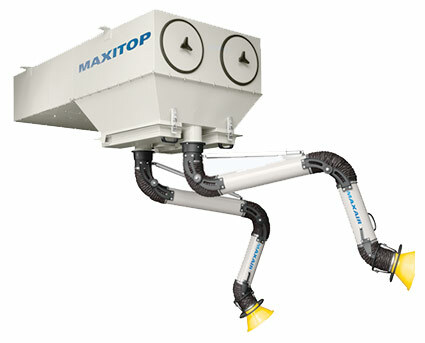 The MAXITOP overhead cartridge dust collector with automatic cleaning system will eliminate the worry of finding the right place for installation. Two models with various C.F.M. capacities are offered: air-in air-out design for filtering and recirculating ambient dust laden air or flanged configuration for source capture with MAXAIR fume arms. If overhead cranes are in place, the MAXITOP units may be hung from any support beam.